Erik Sigurdson was raised in a small town on the Oregon Coast. Growing up he enjoyed playing every sport. By the time he got to high school he played football, basketball, baseball, and even ran on the cross-country team. Erik enrolled at Linfield College in McMinnville, Oregon where he graduated and received his BS in Business with an emphasis in Marketing. While at Linfield he played on the baseball and basketball teams. He was the captain of his basketball team his senior year and voted most improved player. After college Erik worked at an Athletic Club in Beaverton, Oregon. That’s where he began to learn how to maintain wood floors. Each year during the annual Labor Day weekend closure - Erik would screen and recoat the racquetball courts and basketball gym. After three years in the athletic club industry Erik founded Courtsports in 1997. Erik resides in Camas, Washington and has two daughters, a stepdaughter, and an amazing queen! The company grew quickly. Erik used his relationships he had established from playing college basketball and his contacts from the athletic club industry to build his customer base quickly. Before long he landed accounts with the Portland Trail Blazers and other local colleges. Within five years Erik and his crews were servicing up to 300 gym floors each summer season! Refinishing gyms requires a large staff of experienced employees, lots of equipment, and a ton of travel. Erik was only able to service customers in the Pacific Northwest because it required his crews to travel with a truck and trailer to each jobsite. Erik wanted to expand and grow his business but he felt confined to the area he lived. Other flooring contractors were falling short. They would come in and refinish a gym for low bid and never be heard of again. Often making mistakes and wouldn’t come back to fix the issues. Erik didn’t want to be like the others. He formed relationships and trust with his customers. He used the best products and equipment, and was seldom the low bid. He fixed his mistakes and guaranteed all his work for up to 10 years. In 2012 Erik began selling his customers mops and floor cleaner. Erik knew that if he could keep his customers floors looking good – they would be happy. Many floors were not being cleaned properly which resulted in dull and slippery surfaces. So Erik began teaching his customers how to properly clean and maintain their floors. Erik’s customers began buying his microfiber mops. These mops cleaned better than the traditional cotton mops because the pads were made from microfiber and each mop included a fringe pad and cleaning pad. 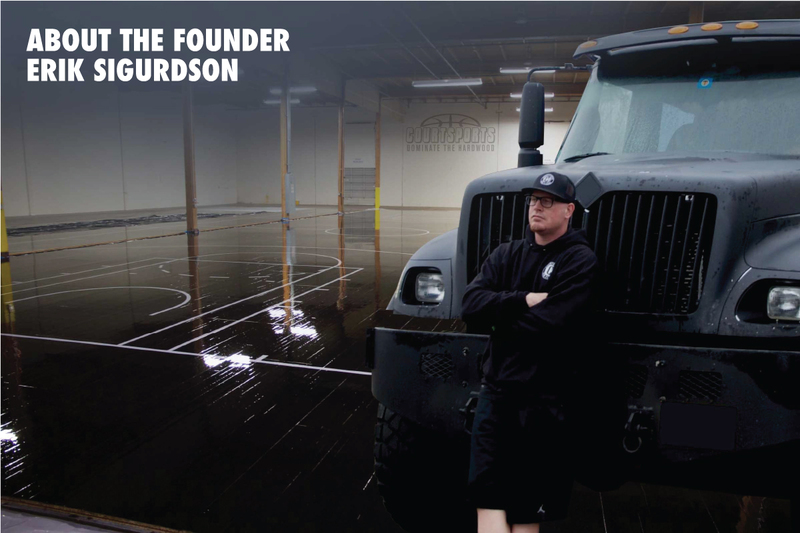 He developed a floor cleaner that was better than any competitive product on the market and branded it Courtcleanze. Mop and cleaner sales increased and Erik found that customers were extremely happy with the increased traction and gloss. In fact some customers didn’t need to recoat their floors on a yearly basis. Another year had passed and his mops and cleaner were beginning to sell nationwide. Online sales were excellent. Suddenly one afternoon -- the Golden State Warriors called Erik and asked if he could provide them with his 36” Promop with their logo? Within a week Erik created a customized microfiber mop and he began marketing it to every team. Today the Promop is used by 26 of 30 NBA teams. Nearly every NCAA Div1 college or university uses the Promop. And the Promop is sold to teams worldwide!